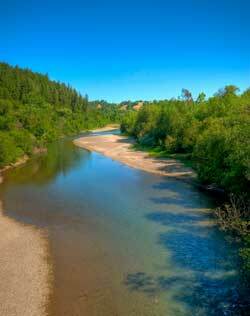 The Russian River Biological Opinion is a federally mandated 15-year blueprint to help save endangered ­fish and ensure our water supply. PPFC Meeting - April 22, 2019 - On Monday, April 22, the Public Policy Facilitating Committee holds its annual meeting to review progress on Biological Opinion implementation. View Meeting Agenda. The Russian River Estuary closes throughout the year as a result of a sandbar forming at the mouth of the Russian River. The sandbar usually closes during the spring, summer, and fall when river flows are relatively low and long-period waves transport sand landward, rebuilding the beach that was removed by winter waves and river outflows. 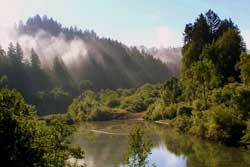 Closures result in ponding of the Russian River behind the sandbar and water level increases in the Estuary. In the past, Sonoma Water mechanically breached the sandbar to alleviate potential flooding of low-lying shoreline properties near the town of Jenner. 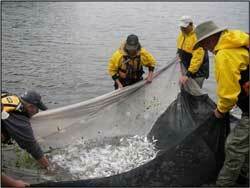 Beginning in Summer 2010, Sonoma Water began implementing a new way of breaching the estuary to enhance rearing habitat for juvenile salmonids (particularly steelhead during the summer), while still managing estuary water levels to minimize flood hazards. Biologists with the National Marine Fisheries Service (NMFS) have concluded that current flow levels in the Russian River and Dry Creek during the summer are too high for young coho salmon and steelhead. 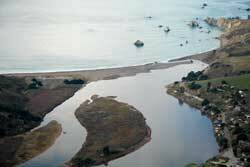 NMFS biologists believe that reducing summertime flows in the Russian River and Dry Creek would provide better fishery habitat by reducing velocity, minimizing the need to artificially breach the sandbar at the river mouth, and potentially improving estuary conditions for steelhead by allowing the formation of a freshwater lagoon. 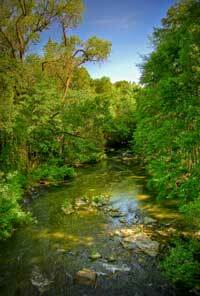 From its outlet in Warm Springs Dam, Dry Creek meanders 14 miles to the Russian River. The creek is home to endangered coho salmon, threatened Chinook salmon, and threatened steelhead (including steelhead raised at the Don Clausen Fish Hatchery). The creek also serves as a conduit for water that is released from Lake Sonoma by the U.S. Army Corps of Engineers (Corps) in the winter for flood control purposes and by Sonoma Water in the summer for water supply. The biological opinion proposes enhancing six miles of habitat along Dry Creek over a 12- year period to create low velocity areas for juvenile coho and steelhead. Regardless of which portion of the Russian River young salmon and steelhead originate, all must travel downstream through the mainstem Russian River and estuary as they make their way to the ocean. Sonoma Water monitors the effects that changes in river management related to the Russian River Biological Opinion have on salmon and steelhead populations over time by operating facilities designed to detect the movement of these fish out of tributaries and into the lower river. 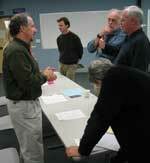 Sonoma Water has created numerous opportunities for public comment on Biological Opinion projects.